OPTIMA® REDTOP® 25 Ultra high-performance SPIRALCELL TECHNOLOGY® AGM (absorbent glass mat) battery with reliable cranking power for your auto, car or truck and twice the life. The OPTIMA® REDTOP® will outperform and outlast traditional batteries in demanding cranking/starting applications. The ultimate high-CCA starting battery for vehicles that have alternators capable of keeping up with all electrical loads. If you have demanding electrical accessory loads such as winches, audio systems, and other devices – take a look at the YELLOWTOP® product line. 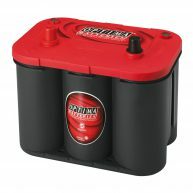 The OPTIMA® model number for this battery is 25. If you are replacing an OPTIMA® battery you already have, this model is the same as batteries marked 8025-160, 9025-160, 27925, RED25, SC25A, or N9925RED.